Safety, performance, and style. Those are the three primary aspects of helmet and sunglass design. The new Scott Cadence Plus and Vector sunglasses achieve all of these things. In this quick review we’ll go over the major key benefits to these new products from Scott and how they might appeal to both triathletes and roadies alike. Let’s start with the Cadence Plus. This is Scott’s entry into the aero road helmet line that has seen considerable growth over the past few years. 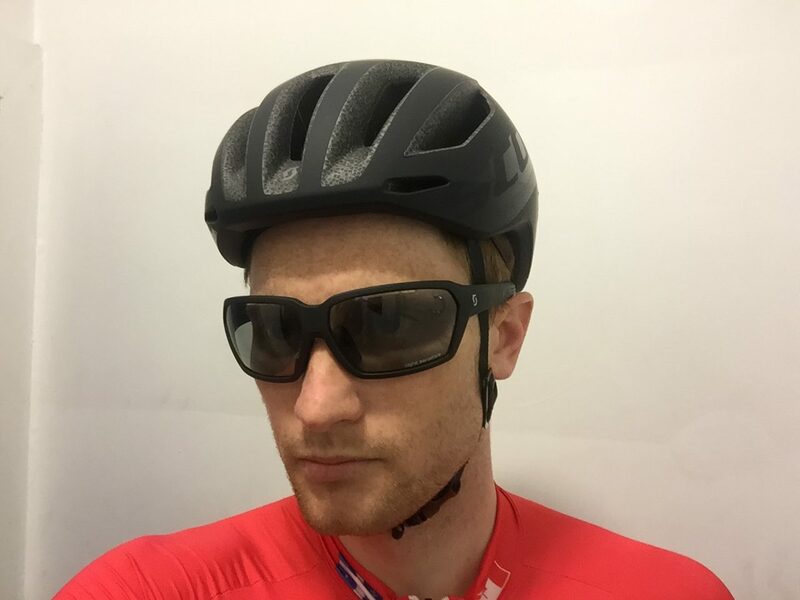 Having used both the Giro Attack and Giro Synthe, arguably the two most well known and best reviewed aero road helmets, we’ll spend a little bit comparing these helmets to the Scott Cadence Plus. With respect to aerodynamic performance, it’s hard to say whether this helmet lives up to its claims but it certainly looks like an aero helmet and Scott’s marketing videos show wind gracefully enveloping and moving over the helmet with seemingly no turbulence at all. If you compare this helmet to the Giro Attack, it clearly comes across as a similar design albeit with more ventilation. While the Attack was fast, fast enough even to be used as a dedicated TT helmet, the ventilation left something to be desired. The Cadence Plus offers both a smooth fluid design with plenty of ventilation to keep your head cool while riding. Scott claims that the vents were designed not only with cooling in mind but also aerodynamics. The air flows through the vents and out the back without disturbing the aerodynamics of the helmet. If true, that would make this helmet worth considering. On the other hand, the Giro Synthe, which also boasts strong aerodynamic design, has much better ventilation than both of these helmets combined. Whether the Synthe performs as well aerodynamically because of its open concept design remains to be seen. If I had to make an educated guess, The Cadence Plus falls somewhere between the Attack and the Synthe in terms of both aerodynamics and ventilation, making the helmet far more appealing in a broad range of uses. Would I use this helmet in a TT or triathlon? Maybe. If I were only going to buy one helmet to use for competition and training, it would certainly be this one. As a road cyclist, this helmet can’t be beat. It provides excellent ventilation and performance. It also looks great and the flat back colour scheme matches almost anything. As far as safety goes the Cadence Plus offers MIPs technology and an incredibly comfortable inner framework. It’s definitely one of the most comfortable helmets I’ve ever worn. But not all heads are the same. If you find KASK and Giro helmets fit you well, you’ll have no trouble with the Cadence Plus. If you’re more of a Cateye or POC wearer, you might find the Cadence Plus a little too circular rather than oval shaped. That being said, the Cadence Plus is a little more forgiving than most of these brands and will likely fit a greater number of head shapes. Scott’s line of accessories is incredible and rarely disappoint. Their optics are no exception. Scott’s sunglasses are not only incredibly affordable but they are exceptionally comfortable and stylish. The frames are made of (or at least coated with) a silicon-like compound that has some give to it. They’re very lightweight and comfortable on the face. The large lens design creates a very large viewing area without the glasses looking like they’re swallowing your face. Something folks with small faces will appreciate. The pair I tested featured Scott’s photosensitive lenses which go from light tint to dark tint. The change happens rapid enough that you never have to squint when the clouds break but also slow enough that you don’t even notice the change when it happens. They contrast well in cloudy conditions and wet conditions and provide excellent protection from the sun on bright days. Overall Scott is certainly a brand worth looking at beyond just their bikes. Their helmet and optics lines are evidence of how much Scott puts into their product development. These aren’t just generic products with a Scott brand, these are well-designed and crafted products that stand on their own. You don’t have to ride a Scott bike to appreciate the quality of Scott’s accessory line up. Check them out at your nearest Scott retailer. You won’t be disappointed.